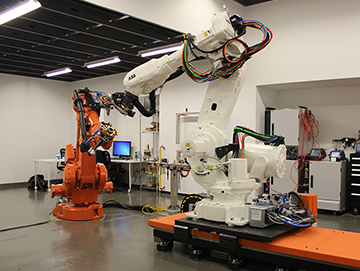 Rob|Arch 2014 will offer 8 workshops dealing with different aspects of robotic fabrication, including multi-robot cooperation, sensor feedback, and advanced design to production workflows. All workshops take place in parallel from May 14-16. The results will be discussed at the conference - along with the scientific papers - on May 17-18. This workshop will demonstrate strategies for interactive and intuitive robot control during the design and fabrication processes. Rather than using the robot in isolation to fabricate digital design, the robot acts as one of many mediators between the digital and physical world throughout the design process. Employing 3D scanning technologies in conjunction with user tracking, human interface devices, various sensors and augmented reality strategies, we can demonstrate multidirectional communication between the human designer, physical materials, computer simulation and robotic scanning/manipulation. The setup and tools will be used, experimented upon, and (ideally) modified by workshop participants. All Bent Out… explores adaptive fabrication techniques for robotically constructing steam-bent wood assemblies. The workshop explores a constellation of hardware and software tools that leverage the material constraints of steam bending (e.g. spring back, irregular grain) as opportunities to develop adaptive fabrication workflows where predetermined machine tasks can be informed by sensor-based events. In particular, workflows using coordinated motion control of two industrial robots and environmental sensing help to negotiate discrepancies between the intended, digitally modeled geometries and the actual, physically bent wood assemblies.